With more than 72 Million search results are shown for googling “Google Alphabet”, the tech landscape is still shaking after Google changed the name of its corporation to Alphabet last Monday. As part of this corporate reorganization, Google is dividing up its business into different units that will live under an umbrella company called Alphabet. At the same time, the new model will force Google to shed more light on smaller projects it's developing, including failures like Google Glass. In spite this is a bit confusing, yet it makes plenty of sense for Google to refashion itself. The company has been taking bigger and bigger bets in the past few years that have very little to do with the company's original mission of organizing the world's information. This move will allow Google to focus on developing its own products, while giving other Alphabet subsidiaries the independence to further their own brands. 1- Larry Page wants to focus on more ambitious projects, where Sundar Pichai ( Google's newly named CEO ) to be responsible of day-to-day operation of Google, while he and Sergey Brin to be more focused on the fun future science research projects that may change the world and be highly lucrative. 2- Let Google focus on building the future rather than maintaining the past by splitting the units where each business now has its own CEO and this is likely on of the biggest reasons behind the new structure it should provide greater transparency of each separate unit as well as the company as a whole. 3- Another key to ensuring the company keeps humming -- and eventually gets its moon shots to make money -- is making sure top execs don't walk away from Google for high-profile jobs elsewhere. Doling out CEO titles for the independent divisions means Google can reward top talent, especially as they become more in-demand from other tech companies. So that would help Google retain and attract talents. 1- This is a company that aspires to cover everything from A to Z. 2- It represents language, "the core of how we index with Google search". 3- Because Alpha-bet means "investment return above benchmark, which we strive to do." Page said. Google co-founder and CEO Larry Page will transition to Alphabet in a co-CEO role with another co-founder, Sergey Brin, as president taking on more world-changing moonshots, and mature them to the level of Google and Android. Meanwhile, Sundar Pichai – who has been put in charge of every major product at the company aside from YouTube, and effectively was considered the second most important employee of the firm, second only to CEO and co-founder Page - will take over as Google's chief after Page and Sergey have made the search engine, operating system and everything in between ready for him to run. Aside from Google, what other companies will there be? Alphabet is a company that will oversee the operations of all of the various projects that currently fall under the Google name. Essentially, it means projects such as the company's driverless cars, glucose-reading contact lenses and its future-gazing X Labs will all be individual companies that will operate (more or less) independently and which all will have CEOs. • A smaller company called Google, headed by CEO Sundar Pichai, that includes the company's core businesses. Those businesses: "search, ads, maps, apps, YouTube and Android and the related technical infrastructure." • Other businesses, "such as Calico, Nest, and Fiber, as well as its investing arms, such as Google Ventures and Google Capital, and incubator projects, such as Google X," which "will be managed separately from the Google business." Well for you and me, these changes won't have a direct immediate effect on us. On the face of it, this is nothing more than a (fairly major) corporate restructuring. However it does encourage more innovation which is always a good thing! 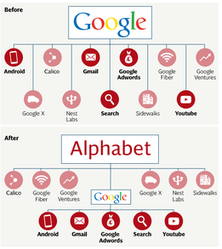 As for Google shareholders, they will simply become Alphabet shareholders, with no significant change in the structure. Even the stock's Nasdaq tickers, GOOGL and GOOG, will remain the same. In conclusion alphabet is ambitious if it succeeds it could help google capitalize on multiple other blockbuster businesses making us healthier, giving us robot helpers and self driving cars. But if Alphabetic fails, this could turn to a massive management disaster where different units of the same company are competing against each other rather than cooperating. Guess we're all just going to have to wait and see. When I first saw this I thought it was a joke, but apparently they did name the mother company Alphabet. I like the Alpha-bet part of it.